Dr. Fernando Rivilla is a pediatric surgeon who works in the Ramon y Cajal Hospital in Madrid, Spain. Since 2009, Dr. Revilla devotes part of his vacations to come to the Saint Joseph´s Catholic Hospital and operate children with diferent conditions that require surgery, mainly congenital malformations or trauma and burning sequels. Dr. Revilla has come every year to the Saint Joseph´s Catholic Hospital to help us and our surgeons, and he is usually accompanied by other Spanish colleagues and friends, such as Dr. Alfredo de Andrés, Dr. Fuensanta Meseguer, Dr. Mª Elena Marchesi, Dr. Pedro de la Calle, Dr. Manuel Gabaldón, Dr. Alberto Rodríguez or Ester Conde. 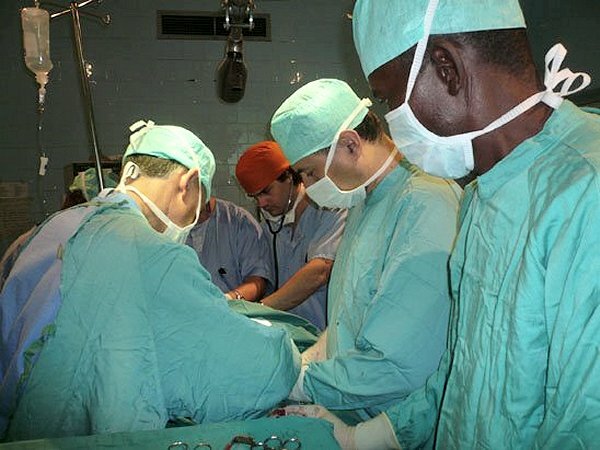 This surgical missions have been possible thanks to the support of different Spanish NGOs, such as Juan Ciudad, Por Africa or Salud Para Todos. Our inmense grateful to all of them. 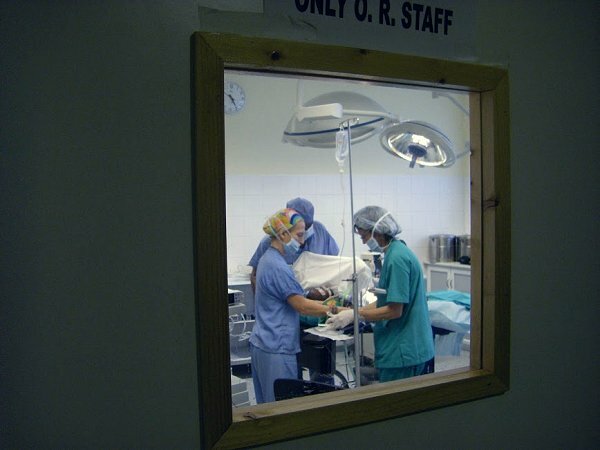 In each of them, around 80 children are examinated by the Doctors, and around 40 have surgery. 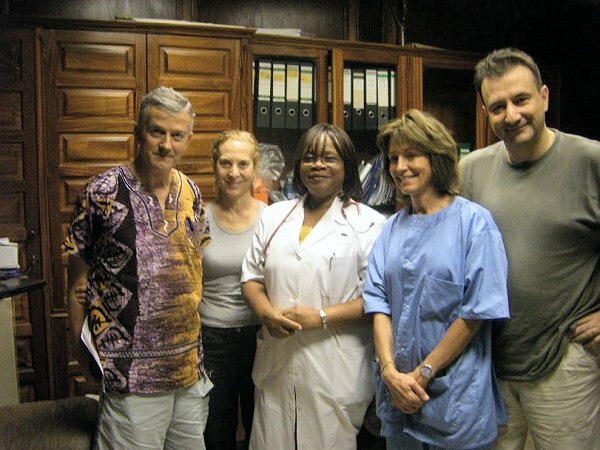 In october, 2012, not only did Dr. Rivilla come to Monrovia for a new surgical mission, but he was kind enough to give a training course on pediatric and neonatal surgery, emergencies and resuscitation. Drs. 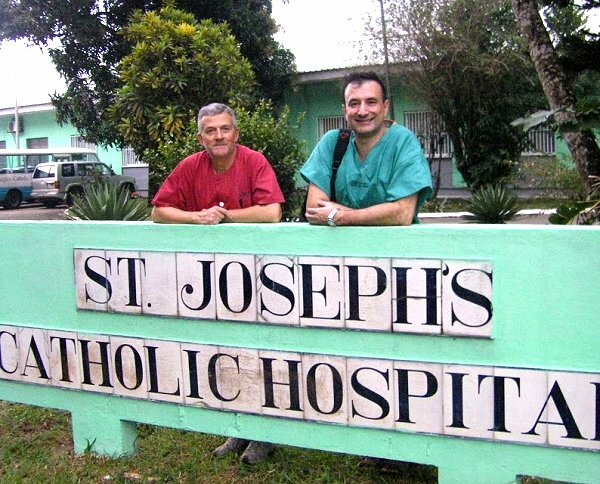 Fernando Rivilla (left) and Alfredo de Andrés (right), at the Saint Joseph´s Catholic Hospital´s sign (Photo signed over by Dr. Rivilla). Doctor Rivilla examinates a little kid (Photo signed over by Dr. Rivilla). 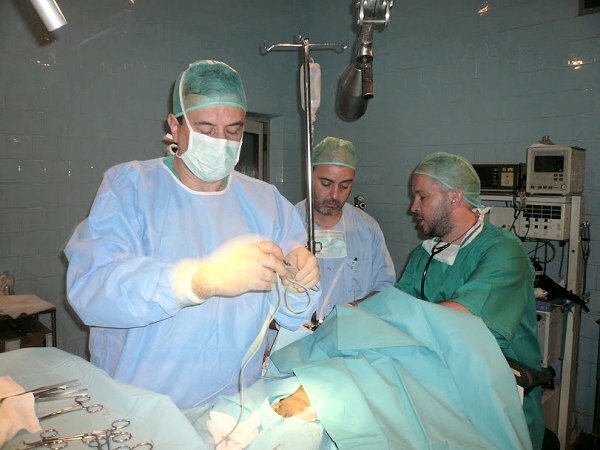 Doctors Alfredo de Andrés, Pedro de la Calle and Alberto Rodríguez, in the operation room (Photo signed over by Dr. Rivilla). Spanish doctors at the operation room (Photo signed over by Dr. Rivilla). Surgeons at the operation room. Saint Joseph´s Catholic Hospital, Monrovia, Liberia (Photo signed over by Dr. Rivilla). Doctors Revilla, Meseguer, Sanvee, Marchesi and De Andrés (Photo signed over by Dr. Rivilla).